Disc 1 contains all tracks from Biohazard The Umbrella Chronicles Original Sound Track (CPCA-10191). 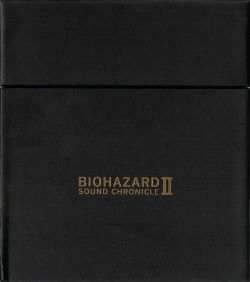 Disc 2 & 3 contain all tracks from Biohazard The Darkside Chronicles Original Soundtrack (CPCA-10213~4). Disc 4 & 5 contain tracks from Biohazard 5 Original Soundtrack (CPCA-10198~200). 4.02, 5.19 are exclusive tracks, substituting 1.02, 3.17 from CPCA-10198~200. 6.01~16 are extra tracks from Resident Evil 5 DLCs. 6.17~37, 6.41 can also be found on Biohazard The Mercenaries 3D Original Soundtrack (CPDA-10069). 6.38~40 are exclusive to this release.